Severe thunderstorms developed across central Iowa during the afternoon of 19 July 2018, producing multiple tornados. Fortunately, 1-minute imagery from GOES-16 was available over the region to aid forecasters during the event. GOES-16 derived motion winds in the area of tornadic development indicated enhanced low-level and deep layer shear just prior to initiation. With surface winds of 12 knots from 160 degrees and GOES-16 DMWs indicating ~1 km winds of 16-20 knots from around 220 degrees, 0-1 km shear was around 16 knots, which is favorable for supercell tornados (Fig 1). DMWs around 6 km were 40-50 knots from 275 degrees, which yields a 0-6 km shear vector of around 49 knots, favorable for supercell development. Figure 2 combines the mesoscale and CONUS winds to show the abundance of winds vertically and horizontally that can be available from GOES-16. Numbers from the nearby DMX VAD wind profiles are similar. GOES-16 CAPE showed convection develop on the western edge of a CAPE max. As has been found in previous experiments, although CAPE derived from GOES may often be lower than other sources, the gradients in the moisture/instability fields are captured well. NUCAPS profiles from Suomi-NPP were available ahead of the line of the line of storms around the time of initiation (Figure 4). 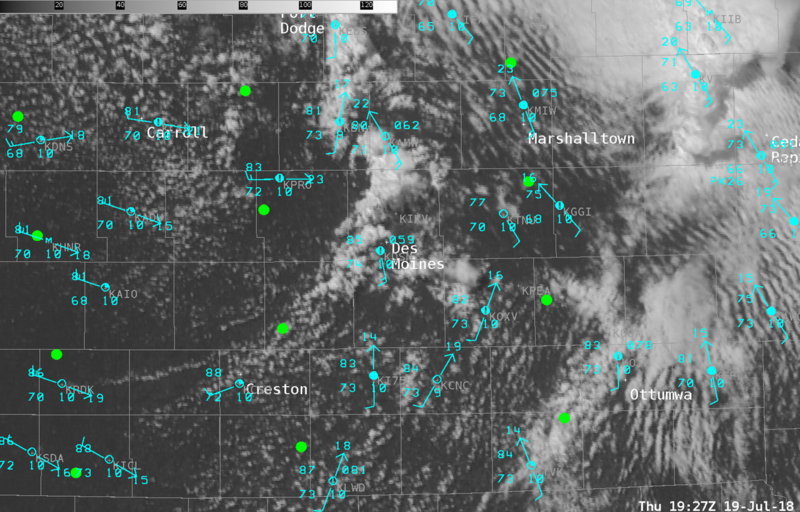 Considering central Iowa does not have a balloon launch, temperature and moisture profiles from polar orbiting satellites have exceptional value. 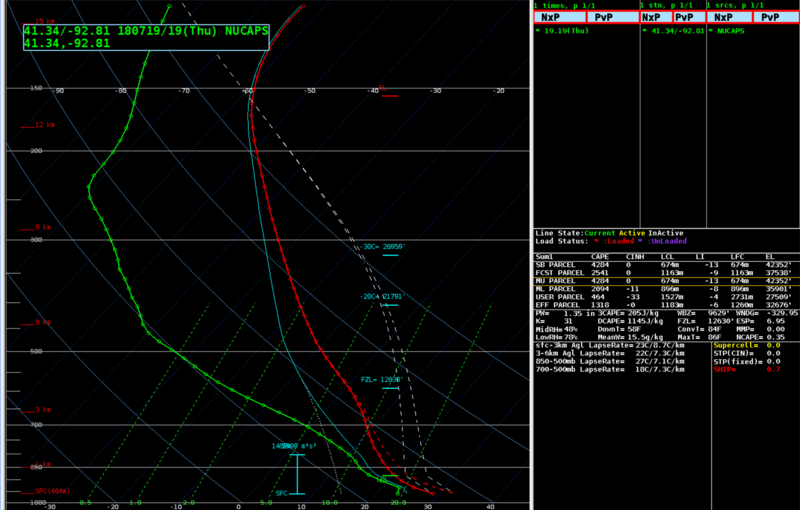 The surface conditions of the profiles need to be modified to match nearby obs. After doing so, the profiles near Des Moines indicated around 2,000 j/kg of MLCAPE and up to 4,000 j/kg of SBCAPE, supportive of strong updrafts (Figure 5). Further, the mid/upper levels of the profiles were dry above moist low levels, indicating favorable convective instability. GOES-16 1-min imagery revealed progressively enhanced cumulus development and clumping northwest of Des Moines between 1800 UTC and 1900 UTC. Initiation took place shortly thereafter, confirmed by the first GLM total lightning detections at 1926 UTC (Figure 6). 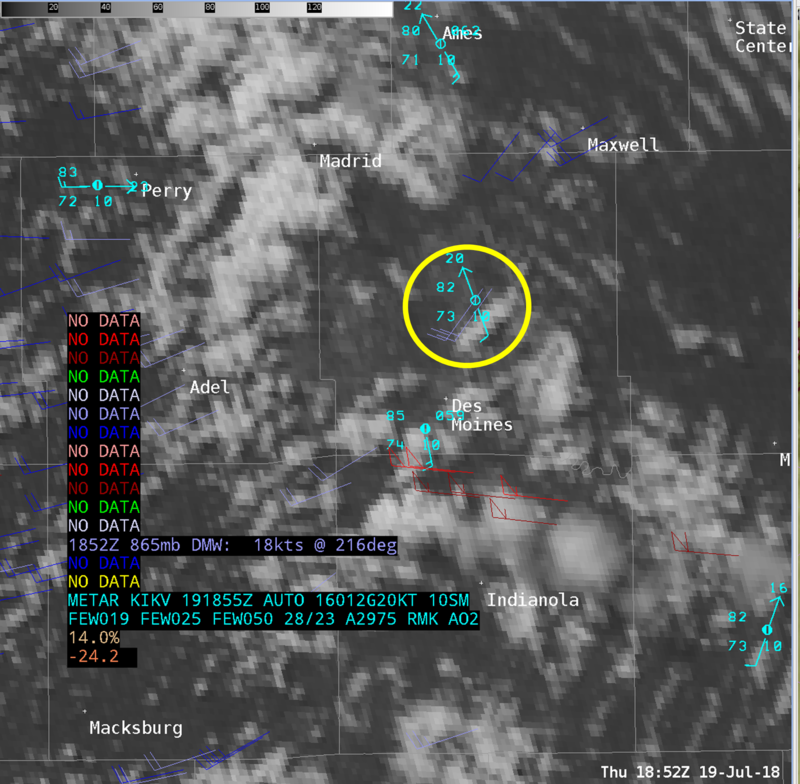 The first tornado was reported around 1950 UTC, just as GLM FED values began to rapidly increase. A max of 3 flashes/5-min was detected at 1940 UTC, and a max of 23 flashes/5-min was detected at 1950 UTC. At 2000 UTC, a max of 100 flashes/5-min was detected with this storm as it continued to produce a tornado. The updraft weakened briefly thereafter, before strengthening again from 64 flashes/5-min at 2037 UTC to 142 flashes/5-min at 2112 UTC when 1.5″ hail was reported. Further south, severe thunderstorms produced widespread damaging winds, including a reportedly fatal storm that capsized boats on Table Rock Lake. GOES-16 1-min visible imagery showed rapid updraft growth with this storm through old anvil clouds up to the tropopause, quickly producing overshooting tops and an above anvil cirrus plume, the latter of which is a sign of a particularity strong storm.